Everyone will remember the devastating earthquake that struck Haiti on 12th January. Nearly 200,000 people were buried alive and tens of thousands of homes have been destroyed and people’s livelihoods devastated. 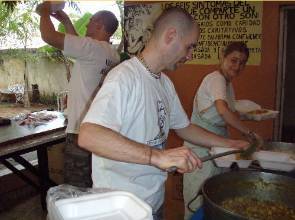 The Lotus Trust, the welfare arm of Bhaktivedanta Manor, is working with partner food relief organisations with an ISKCON centre in nearby Santo Domingo, in the Dominican Republic. Food for Life Global have established a secure camp site for food distribution in Port-Au-Prince and are partnering with Water for Life Global who are providing sanitation service. Other devotees are distributing lunches to earthquake survivors who are now being cared for in the Dr. Dario Contreras Hospital in Santo Domingo. Volunteers prepare the food and then package them to be handed out at the hospital, which specializes in trauma.